I wasn't surprised that I didn't get the Republic's endorsement, I was surprised they weren't more honest in justifying their decision. All they had to say is "The Other Guy is wonderful" , and list all the great things he has done in office. Instead they decided to attack me, and they didn't even get their facts straight. Google didn't locate in Gilbert, because Google didn't locate in Arizona . I notified both the Chamber of Commerce and Small Business Alliance that I would not be accepting special interest endorsements, but that hardly qualifies as a "tiff". Special interest endorsements always come with strings attached. 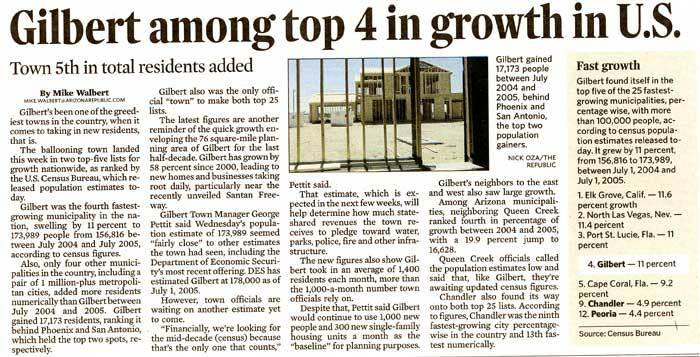 The undeniable fact is more business's located in Gilbert in my administration than any time in Gilberts History. The most patently inaccurate statement in the editorial endorsement was that Mayor Lewis is a Regional Leader and I was not. What do they base that on? Don't just say he is a regional leader, name the regional organizations his fellow Mayors have chosen him to lead, other than rotating into the Chairman seat at Phoenix Mesa Gateway Airport. I served two terms as Chairman of Phoenix Mesa Gateway Air Port. More importantly my fellow Mayors in Maricopa County and Arizona elected me President of the Arizona Municipal Water Users Association, Chairman of MAG's TPC ( I defeated Mesa Mayor Scott Smith for that position), Executive Board of Arizona League of Cities and Towns, and Executive Board of MAG. The same cannot be said of Mayor Lewis. The undeniable fact is Gilbert enjoyed the greatest prosperity in its history under my administration, and the Republic's attempt to marginalize my role in that success is dishonest. My campaign is built around tangible achievement in office. The Bible says "You shall know the tree by the fruit that it bears". I ask the voters in Gilbert to look at what I achieved in office, look at what Mayor Lewis has achieved in office, and make up your own mind.